Lugosi was a horror god. He had the ability to scare the bejesus out of everyone, including unsuspecting trick-or-treaters. Unfortunately, he hit the skids in a big way, when he moved into this little flat on Harold Way, in Hollywood. This is where he lived through his infamous Ed Wood period. His death in this simple home on August 16, 1956, led Lugosi to the pine condo for the very last time (he spent most of his career there). He was 73 years old. Years of morphine, Demerol and other drug use, due to a war injury, had taken their toll. 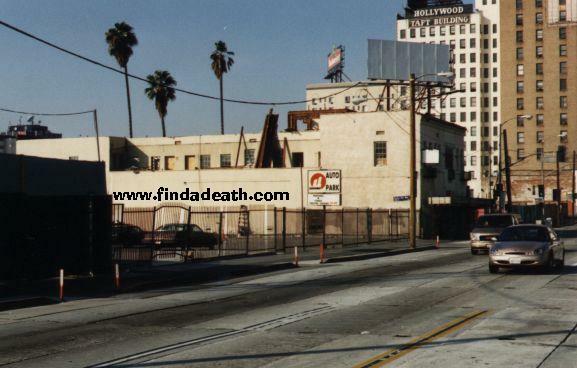 and Lugosi was (WARNING: dead pics) laid out at the now razed Utter-McKinley Mortuary, at 6240 Hollywood Boulevard. I grabbed a hunk of it before they tore it down. Hundreds of fans lined Hollywood Boulevard to view his body, laid out in his Dracula cape. Legend has it that Peter Lorre and Boris Karloff were viewing the body of their old friend, who had risen out of so many coffins as Count Dracula, Lorre said, “Come now, Bela, quit putting us on!” Bela’s casket was taken by hearse to the cemetery. 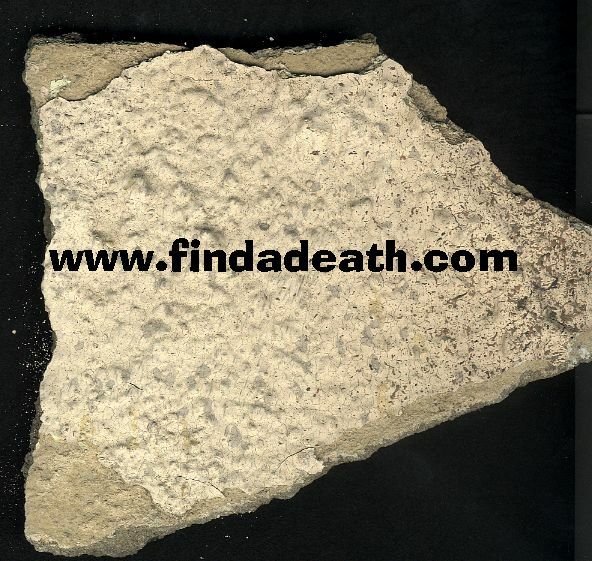 From Findadeath friend Davi: I recently found your site, and read the Bela Lugosi piece that you wrote. I believe that you are wrong in stating that Lugosi died after the release of Plan 9 from outer Space. 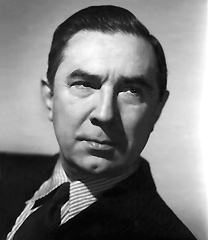 Bela Lugosi died in 1956, and Plan 9 was released in 1957. 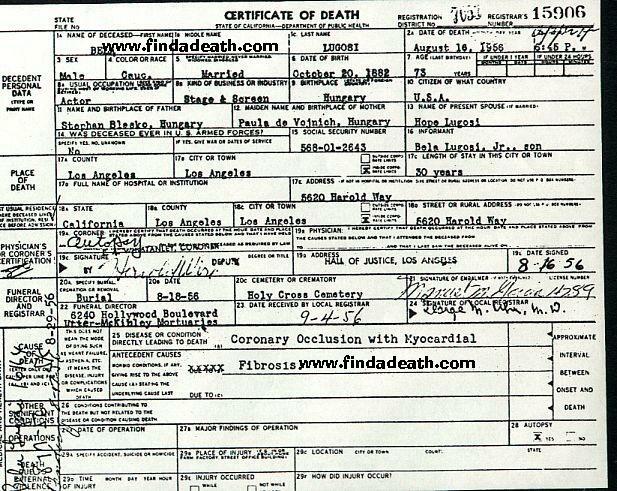 Dan Meadowcroft writes: I went to Utter-McKinley Mortuary around 1988. At that time I believe it was a theater of some sort, and I went in and spoke to a couple of people there. They took me to where they laid the people out when it was the mortuary, and said something to the effect that they never ran the air conditioning in that area much, because it was always very cold, and a lot of people had very creepy feelings about working in that area, much less the whole building!!! Also, I have a pic from Harold Way I took the same time I was down there. I noticed in your pic they have tried to clean the area up…the pic I took it was “dump” and I was quite scared to leave my car to take the pic. 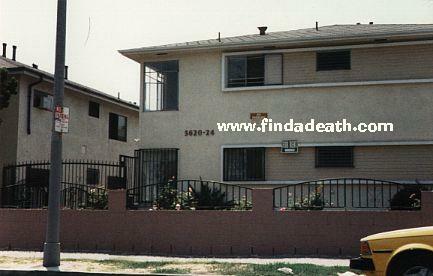 It’s a perfect color shot of the building, showing the corner apartment where he died. Last one I have I took also on the trip, it was his house on 2227 Outpost Road. They were remodeling at the time, and the house was so huge I had to take two pictures to get the whole house. Legend has it he made this home earthquake proof and bomb proof. I hear the owners of the house have a plaque on the house saying Bela Lugosi used to live there??? If you would like these to add to your website, let me know and I will be happy to send them out!!!!!!!!! Please do Dan. Also, I worked ever so briefly with a gentleman that grew up in the Outpost house. He told me that he read in a biography that Bela kept panthers as pets, and buried one in the backyard. It became his summer project to find the panther’s skeleton, and did. I just thought it was a cool story. Opus sends us this: Now I know you are a huge fan of the “Ed Wood” movie, can’t we somehow verify that Bela’s merchandise outsells Boris’s (as stated at the end of that movie?) Sure, Bela is dead, but it would have pleased him immensely if that was stated in his Find a Death obit. Now I’m reading dead men’s thoughts. 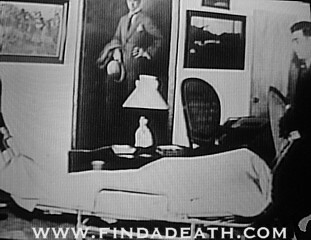 Here is a picture of Bela in his casket, per his own request – in his Dracula costume. Warning, dead guy. Bela is buried in Holy Cross Cemetery, Culver City. Trivia: Bela supposedly died with a script entitled “The Final Curtain” in his hands. “There is no such frisson in “Plan 9 From Outer Space”, unfortunately, to which I reluctantly award the booby-prize as the worst horror film ever made. Yet there is nothing funny about this one, no matter how many times it has been laughed at in those mostly witless compendiums which celebrate the worst of everything. There’s nothing funny about watching Bela Lugosi (actually, a stand-in was used for most shots) wracked with pain, a morphine monkey on his back, creeping around a southern California development with his Dracula cape pulled up over his nose. Lugosi died shortly after this abysmal, exploitative, misbegotten piece of trash was released, and I’ve always wondered in my heart if maybe poor old Bela didn’t die as much of shame as of the many illnesses that were overwhelming him. It was a sad a squalid coda to a great career. Lugosi was buried (at his own request) in his Dracula cape, and one likes to think — or hope — that it served him better in death than it did in the miserable waste of celluloid that marked his last screen appearance.” Heavy stuff from Mr. King, eh? 1. Bela had serial marriage nailed long before Liz Taylor was born. By the time Bela Lugosi married Lillian Arch, an Hungarian-American nearly 30 years his junior, in 1931, he had already been married 3 times. At the time of their nuptials, he was almost 50. Of his 5 marriages, this one lasted the longest. When the end of the marriage landed in a California divorce court in the early 1950s, she, understanding that he had fallen upon hard times as an actor, did not ask for child support for Bela, Jr. Instead, she had secure employment as a bookkeeper. 2. His fifth wife and widow, Hope Littinger, was a few years his junior too. She had admired him as a person and actor, when she first saw Dracula during the 1930s. Supposedly, on the day they married, I think in 1955, Bela got on the phone and called wife #4, asking her to take him back! 3. Now here’s something totally cool. Both Lillian and Hope pooled their financial resources to see to it that Bela got a decent burial in August 1956. 4. While playing Dracula was his greatest success, it was also his greatest downfall. In the Hungarian theater, before World War I, Lugosi was talented enough to play anything from a gigolo in a comedy to Jesus Christ in a passion play. Before he immigrated to the United States in the early 1920s, he had a part as an American Indian in a silent movie version of the Leatherstocking Tales. It’s too bad, with his rich accent and built-in dignity, that he could not display all of his versatility in Hollywood. This was sent to me by Findadeath.com friend Walt Werner: “Joey Bishop was on a talk radio show not too long ago in Chicago, when he became quite agitated at the interviewers, who were trying to “dig up dirt” on Frank Sinatra. He ranted that Frank had done many good, unpublicized deeds, like paying for funerals of many actors that died paupers. When pressed for examples, Joey mentioned that Ol’ Blue Eyes picked up the tab for Bela Lugosi’s final act.” Hmm, never heard that one. Thanks, Walt! Feb 2002, Findadeath.com friend Laura Schiotis sends us this: I was looking at your Bela Lugosi bio and I have a few comments about Bela you might want to add to your page (or ignore, whatever): Many people say that Boris Karloff made the comment “Bela, you’re putting us on” to Peter Lorre or whoever at Bela’s funeral. But Boris wasn’t at the funeral. In fact he was in England at the time, so obviously he could not have said such a thing. Incidentally, Bela’s third wife, one Beatrice Woodruff Weeks, was Mrs. Bela Lugosi for only three days! Bela was an old fashioned, Old World kind of guy and expected his wives to wait on him hand and foot. Beatrice, however was too busy with her own hangovers to take care of Bela. I read something in a biography of Bela Lugosi that I found both funny and interesting. Bela was doing a stage role that he hoped would get him noticed and according to a newspaper Bela came on stage to deliver his lines and accidentally tripped over a ‘carefully laid pipe’ that ‘propelled’ him into the air where he then landed on the other side of the stage, knocked over an easel with paint and got paint all over himself. The audience thought it was hilarious but Bela got up, brushed himself off, acted oblivious to the whole thing and delivered his lines . I think this shows that he was truly a great actor, and it even illustrates his often sad life, he fell, brushed himself off and somehow managed to carry himself with dignity despite the situation. This just in, December 2004, from Findadeath friend Steve: Just read your new updates on Bela Lugosi. The guy who “corrected” you by saying that Lugosi died in 1956 but that the film Plan 9 From Outer Space was released in 1957 is more incorrect than you are! True, one of the great, hilarious, but also sad things about Plan 9 is that Bela actually died during the making of it, and director Ed Wood got his wife’s chiropractor to stand in for him, with a Dracula cape in front of his face and everything! When Lugosi’s parts of Plan 9 were being filmed, those scenes were intended for a film called Grave Robbers from Outer Space. Ed Wood changed them around, added new footage and things and renamed it Plan 9 From Outer Space and released it 1959, not 1957. 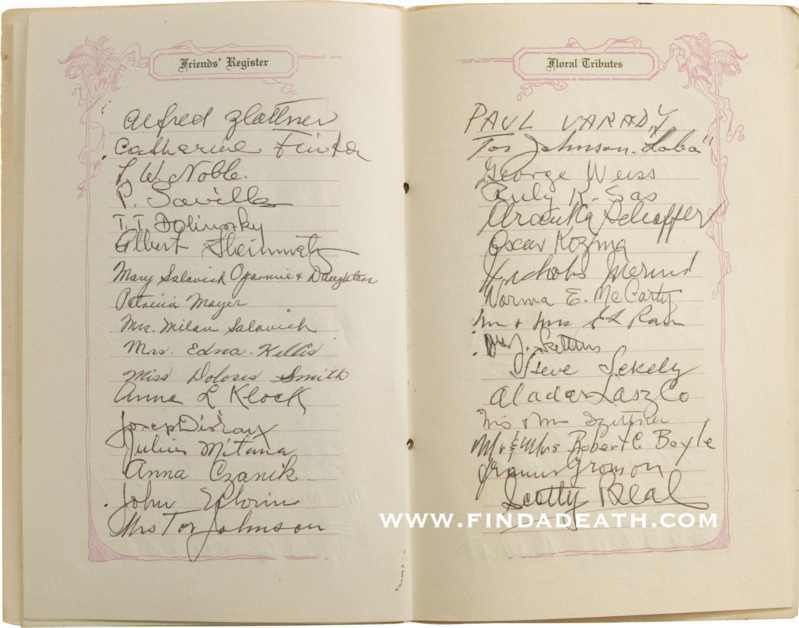 July 2007 my friend Lisa Burks turned me on to the fact that Bela’s condolence register was up for auction last year. One of those amazing relics I’d love to have owned. 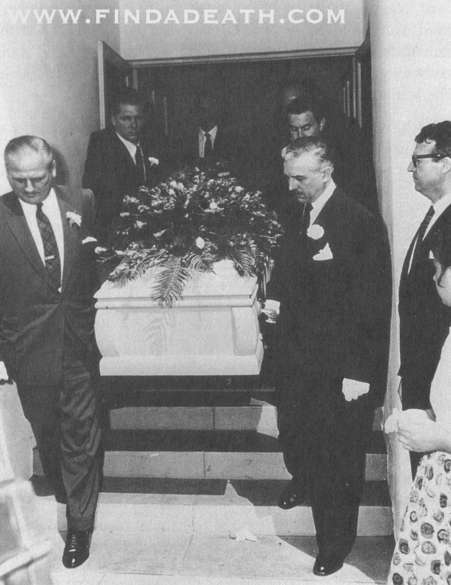 His funeral took place on August 18th, coincidentally Criswell’s birthday. It reads as a who’s who for Ed Wood fans. Amazing find, Lisa. Thank you for passing it on, I’m sure whomever bought it (12Grand yikes!) will cherish it. I hope they put it on display at some point for others to see. 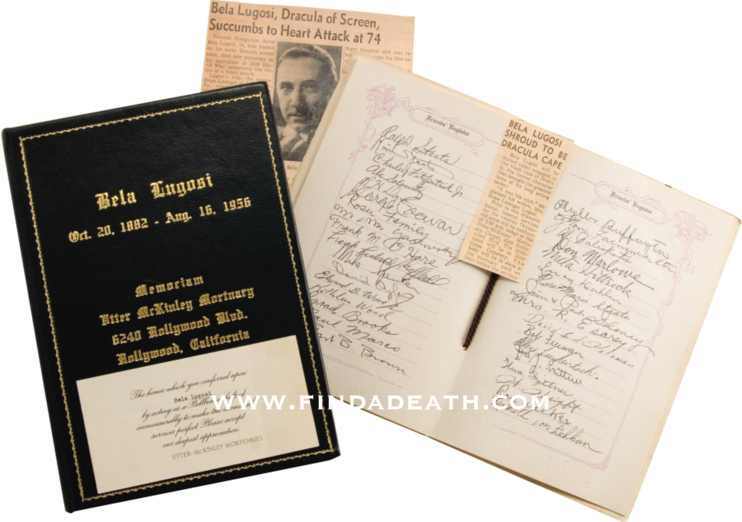 The Bela Lugosi Funeral Book and Pallbearers Card with a Custom Leather Case.